Heat oven to 400°F. Lightly spray 9-inch glass pie plate with cooking spray. Unroll 1 can of pizza crust dough. Place dough in pie plate; press against bottom and side of pie plate to form crust. In small bowl, mix pizza sauce and mushrooms; spoon onto dough in pie plate. 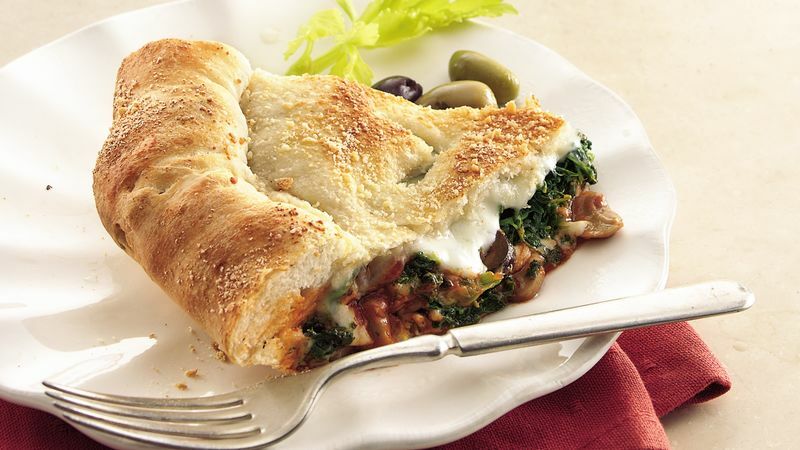 Layer with olives, 3/4 cup of the mozzarella cheese, the spinach and remaining 3/4 cup mozzarella cheese. Unroll remaining can of dough. Press dough into 9-inch circle; place over filling. Pinch edges of dough together to seal; roll up edge of dough or flute to form rim. Cut several slits in dough. Brush with oil; sprinkle with Parmesan cheese. Bake 35 to 40 minutes or until deep golden brown. Cut into wedges. To make sure the spinach is thoroughly drained, place it in a colander. Once it’s thawed, use the back of a wooden spoon to press out the moisture.